Cardamom adds a touch of the exotic to the all-American vanilla milkshake. Photo courtesy McCormick. 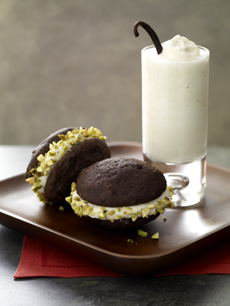 It could be the best vanilla milkshake recipe: This Vanilla Cardamom Milkshake Shooter pairs with the Vanilla Cardamom Whoopie Pies—a luscious combination with an exotic and luxurious flavor match. Make them both as a casual-yet-elegant dessert, or enjoy this milkshake by itself. It takes just a minute to make. 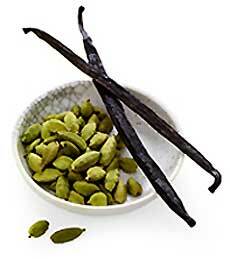 The cardamom and vanilla pairing is one of McCormick’s 10 flavor trends for 2008. See the other flavor trends. Milkshakes were popular in soda fountains by the mid-1880s. A Lightning Shaker for mixing milkshakes was patented in 1884. There’s been a whole lot of shaking going on ever since. Place ice cream, milk, vanilla and cardamom in blender container; cover. Blend on high speed until smooth. Pour into glasses. Sprinkle with additional cardamom, if desired.